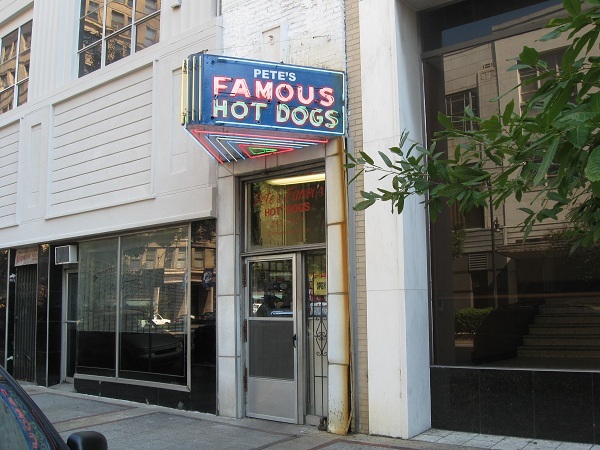 Pete’s Famous Hot Dogs, Birmingham AL (CLOSED) – Marie, Let's Eat! So I was sketching out this trip and my daughter requested a hot dog while we were in Birmingham. That suited me just fine; I’m mercenary enough to want to add more chapters to this blog, and we had bypassed Pete’s Famous Hot Dogs, arguably the best-known restaurant in the city, in favor of one of its competitors the last time we visited. Having now tried both, I’m prepared to make an unusual claim: I prefer the dog that George makes at Gus’s to the one that Gus makes at Pete’s. Okay, let me try that again. Pete’s is an incredibly popular little restaurant on 2nd Avenue North. I’m not kidding about “little,” as it is only about five feet wide inside. It opened in 1920 and, when Birmingham was more of a banking center with something like a thriving downtown, it ushered in competitors on every avenue. Many of these have since closed, but one that remains is Gus’s on 4th, which we tried back in May and really enjoyed. Gus is also the name of the gentleman who runs Pete’s these days, and serves up these tasty dogs in what must be one of the smallest restaurants in America. On Saturday, we enjoyed spending a couple of hours in the early afternoon hiking at Ruffner Mountain Nature Center, which I strongly recommend. We’ve started spending more time looking for places to stomp around in the outdoors than digging through quasi-antiques in dirty old shops when we go out of town. The hike, a little over a mile and a half and also including a little visit to see some turtles and snakes in the visitor’s center, was great fun and, for my daughter and me anyway, it really gave us an appetite. It’s about six miles back down 1st Avenue North into the downtown district, and parking is a bit of a headache. There are a few spots on 2nd but just as many places where you cannot park because what you think is a parking space is actually a bus stop. We ended up stopping, probably illegally, around the corner in some finance company or something’s lot. I wouldn’t have wanted to leave the car there for any longer than twenty minutes, put it that way. There’s apparently no time to go and avoid a crowd. Whether you’ll be waiting with tourists like us or grandfathers making their thousandth visit, there are usually a few people lined up and jockeying for a place at the counter. There are no chairs; the restaurant’s closet-like interior is simply too narrow for them. The dogs themselves are quite good, grilled according to a secret recipe that some claim involves being dropped for seconds into boiling milk before hitting the grill, and then served on a bun with chili, onions and kraut – if you like kraut, anyway – ladled over them. You can eat them at the counter if there’s any room, or, if you’re feigning claustrophobia like my daughter, you can take yours outside. They haven’t room for a fry grill in this teeny space, but they can offer you some Golden Flake brand chips to go along with it. I was a little disappointed that Pete’s was out of their house orange drink, which sounds curious, but they do serve Grapico in twelve and twenty-ounce bottles. Pretty much unavailable outside of Alabama and west Georgia, Grapico is the Buffalo Rock Bottling Company’s house grape soda, and by leagues tastier than just about anybody else’s grape soda. Well, maybe it’s not as good as NuGrape, but it sure is good, and it goes very well with a Pete’s dog. I can’t tell you how much I approve of this. Everybody should enjoy the chance to get a locally-made soft drink when they’re visiting a good restaurant in the heart of that drink’s main distribution area. All things being equal, I understand that Pete’s is legendary and I am incredibly pleased to have tried this neat dog in such a great little place, but I have to say, I did prefer the dog that I had a few months back at Gus’s. I liked that chili and that thick, brown secret sauce just a little bit more than Pete’s special. Whichever you prefer, both restaurants are absolutely worth a visit, and darned if I know of anyplace else where you can find two such delightful hot dog stands so close to each other. Any food lover passing through Birmingham certainly needs to stop in and try one or the other, or, heck, both! 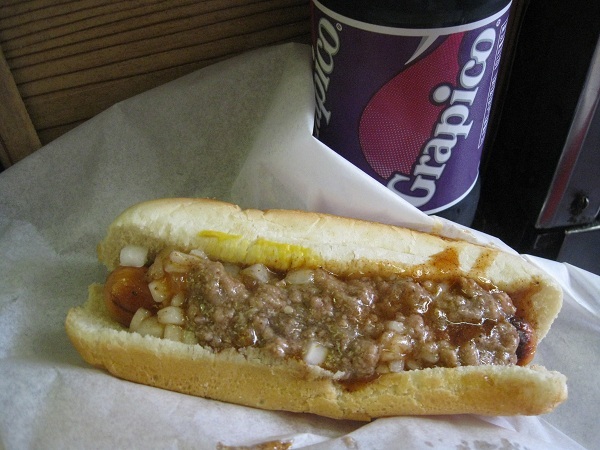 Posted on October 5, 2010 July 29, 2017 by Grant G.Posted in alabama, birmingham, goodbye, hot dogs, roadfoodTagged alabama, birmingham, closed!, hot dogs, roadfood.com.